Leukemia refers to the abnormal cell multiplication of the bone marrow and blood. 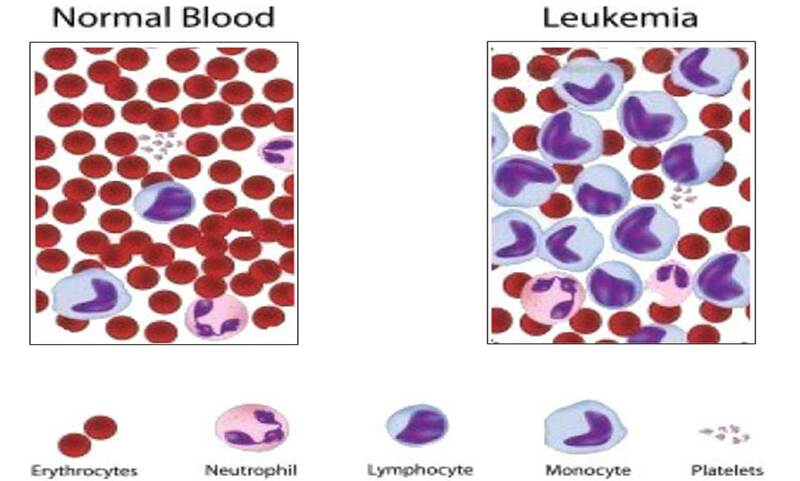 Leukemia does not produce a tumor like other cancers. However, it overproduces abnormal white cells. The abnormal cells are cancerous, called leukemic cells, and are unable to fight infections just like the natural white cells. They also interfere with the production of other types of blood cells. In the end, the level of red blood cells in the system is too low that oxygen supply to tissues and cells becomes a challenge. The blood clotting and immune system are also hampered. Leukemia causes anemia because the production of red blood cells is reduced to an abnormally low level, which slows down oxygen delivery to body muscles and organs. People with anemia tend to have a pale complexion and get tired easily. Individuals with leukemia may bleed from their noses, gums or may find blood in urine or stool. Even minor bumps may cause severe bleeding and small discolored spots referred to as petechiae may develop under the skin. Since leukemia affects the body’s ability to fight infections, a person with this type of cancer may develop infections such as bronchial pneumonia, sore throat, mouth sores, etc. Lymph nodes are tiny bean-sized structures that are composed of a cluster of lymphocytes. People with leukemia have abnormal white blood cells and the lymphocytes may collect on the lymph nodes in the groin, armpits, and throat, resulting in enlarged lymph nodes. Leukemia can affect the body in other ways, such as loss of weight and appetite, and discomfort under the left lower ribs because of the swollen spleen and abnormal collection of lymphocytes. A feeling of weakness all the time also characterizes the disease. Leukemic individuals may have a fever lasting 1-2 weeks coupled with night sweats. How does leukemia affect the body? Are there any ways to treat leukemia? Treatments for leukemia include biological therapy, chemotherapy, stem cell transplant, targeted therapy, and supportive treatments. Generally speaking, chronic leukemia cannot be cured, but it can be controlled with the treatments. Chemotherapy refers to the administration of medications that kills tumorous cells such as leukemia cells and other cancer cells. Chemotherapy may involve taking oral pills or may be delivered through the intravenous line directly to the bloodstream. The drugs are usually a combination of various effective medicines, which kills cancer cells. The mode of administration is in cycles and rest period is between them. The side effects of chemotherapy largely depend on the drugs and the regimen. However, some common symptoms of people on chemotherapy include nausea, hair loss, mouth sores, vomiting, easy bruising, loss of appetite and increased risk of developing other infections because of low immunity. Biological therapy is one of the choices if you have known "how does leukemia affect the body". Biological therapy is a mode of treatment using living organisms to treat leukemia. The treatments allow the immune system to recognize the abnormally multiplying cells and attack them. Biological therapies do not have severe side effects when compared to chemical therapies. Some of the side effects include swelling at the injection site, rash, muscle aches, headache, fever, and tiredness. Targeted therapies are drugs which disrupt the specific mechanism of the tumor cells rather than eradicate the cancer cells rapidly. Targeted therapy causes less damage to normal cells when compared to chemotherapy. A targeted cancer therapy causes the target cells to cease from enlarging rather than dying, and they interfere with specific molecules that promote growth or spread of cancers. The mode of administration of targeted therapy is usually injection or pill. The side effects include bloating, swelling, a sudden weight gain, diarrhea, nausea, vomiting, rash and muscle cramps. Radiation therapy utilizes high-energy radiation which targets cancer cells. The radiation therapy is used if leukemia has spread to the brain and it can be used to target areas such as spleen where the leukemic cells have accumulated. Radiation therapy has its own side effects. The side effects usually depend on the location where the radiation is applied. If radiation is applied to the abdominal area, then it can result in diarrhea, vomiting, and nausea. For radiations on the skin, it may cause reddening, tenderness, and dryness of the skin. General tiredness is common during the therapy. How does leukemia affect the body? Can you treat it with stem cell transplant? Yes. This type of therapy refers to administration of high radiation or chemotherapy to destroy cancerous cells in the bone marrow. Thereafter, transplanted stem cells are intravenously delivered, which will produce new blood cells. Stem cells may originate from the patient or from a donor. The regular treatment for leukemia deplete normal blood cells, this increases the risk of infections and bleeding. Supportive treatments are used to prevent complications arising from the cancer therapy. In addition, the supportive treatments are important in minimizing the side effects of radiation or medical therapy. Supportive treatments given to patients undergoing therapy include flu vaccines, anti-nausea medications, and antibiotics among others.